Gmail's blog announced that 6 labs features have graduated (Search Autocomplete, Go To Label, Forgotten Attachment Detector, YouTube Previews, Custom Label Colors, Vacation Dates), while 5 other features are retired from Gmail Labs (Muzzle, Fixed Width Font, Email Addict, Location in Signature, Random Signature). Google says that "these decisions were made based based mainly on usage," so that's the reason why obscure features like Muzzle, a quick way to hide Gmail chat status messages, or Email Addict, which blocked Gmail's interface for 15 minutes, were removed. 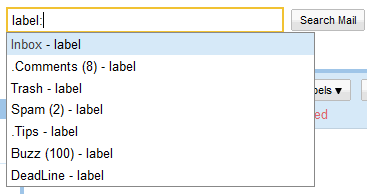 The good news is that 2 labs features will greatly improve Gmail search: "Search Autocomplete" and "Go To Label". If you have many labels, it's difficult to find one of your labels, especially if you added the label to the "more" dropdown. "Go To Label" adds a keyboard shortcut that lets you quickly open a label: type "g l" and then type the first letters of the label you want to find. Gmail integrated "Go To Label" with the search box, so the keyboard shortcut only adds "label:" to the search box. If you don't like keyboard shortcuts, just type "label:" in the search box, followed by the first letters of a label. The autocomplete feature is not useful only when you want to open a label you've created. You can also use it for built-in labels like "unread", "starred", "chat", "buzz", "muted". Type the first letters of the word "unread" and you should find a quick link that shows all your unread messages. 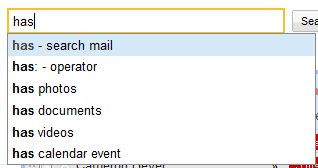 If you use Gmail's advanced search operators, the autocomplete feature shows common values for the operators. Type the "is" operator and Gmail shows a list of built-in labels. Gmail's search box lets you restrict the results to messages that have attachments or to messages that include a certain type of attachment. Type "has" and you'll see a list of options that show messages with photo attachments, documents, videos or calendar events. You can also type natural language queries like: "photos", "documents", "attachments". The search box is now the quickest way to find messages from one of your contacts: type the name of a contact or only the first letters from the name and you can read all the conversation with that person. If you want to restrict the results to the messages received from a contact, type "from:" before entering the name. * "Attachment Detector" shows a warning when you use words like "attached", "attachment" in a message without actually attaching a file. * "YouTube Previews" lets you watch inside Gmail the YouTube videos linked from a message. * "Custom Label Colors" is useful if you have many labels and the 24 color combinations offered by Gmail aren't enough. * "Vacation Dates" improves Gmail's vacation responder by adding the option to enter the first day and the last day of your vacation. I'm surprised that SuperStars and Quick links haven't graduated already. They are the most useful features from the labs for me. As you said it's the most useful label features for you, it doesn't mean that it's useful to everybody else or at least it maybe less popular than these ones. But who knows you may find them graduating in the next few days. Not localizing the "Attachment Detector" feature confirms the stereotype, that people in USA thinks everybody writes letters in English. 1) Muzzle was really useful. 2) The only thing that Google should do with search they haven't done: that feature that guesses what you wanted to type, when you misspell the query. My Google interface is in Portuguese, so I guess it translates as a link, on the top of the results page like "Did you mean:"
I agree with Gustavo "2)". In some countries sometimes words have accents ! a) what are the limits for the total number of filters and label one can create in gmail ? 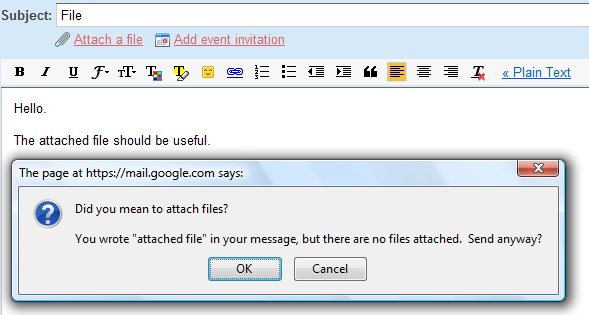 b) if gmail forecast to make keyword searches available inside attachments (html,...) files ? From what I know, there's no limit for the number of labels or filters you can use in Gmail. Searching attachments would be a great feature, but it's probably too complex for Gmail's indexing infrastructure. Maybe Google should import Gmail's attachments to Google Docs. I had over a thousand unread emails, did not know it(mostly junk)! Thanks for the tips. I'd love to be able to search for a word in the body, ignoring the to and from headers, and if possible the signature in my footer. I.e. I want to know if an email has mentioned my organization's name, but the name is in my email address and my signature, so I get a huge number of false positives. I tried "body:" as an operator, but it's not recognized. Hey, you guys should check this out: CloudMagic. It provides super fast search for your Gmail inbox.